Q. Does Judaism believe that man is a sinner? A. Classical Christianity would say yes: Judaism says no. The basis of the discussion is the sin of Adam and Eve. God told them not to disobey, but they did. For Christianity, this has lasting theological consequences. Man “fell” from his original state of innocence and henceforth is tainted by the effects of the sin, though some groups within Christianity deny that the sin persists through the generations but maintain that man has an inherent status of sinfulness. The way out is to accept that Jesus sacrificed himself to redeem humanity from sin. In Judaism it is a story without deep theological consequences. 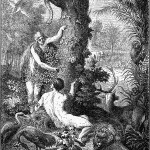 The early chapters of B’reshit explain how many things began – clothing, food, gender, language, and death (since God warned Adam and Eve that if they sinned they would die, and their sin therefore brought death into the world). There are passages in the Bible that speak of inherited sin, e.g. the section of the Ten Commandments that says that God visits the sins of the fathers upon the children to the third or fourth generation. There is a statement in the Prophets, “The fathers have eaten sour grapes, and the children’s teeth are set on edge” (Jer. 31:29, Ezek. 18:2). Other passages insist that “the soul that sins, it shall die”: Ezek. 18:20, Jer. 31:30. Rare Midrashim attach greater significance to the sin of Adam, but they do not represent normative Jewish doctrine. Solomon Levy said that where Christianity posits Original Sin, Judaism responds with a doctrine of Original Virtue. This entry is filed under Ask The Rabbi, B'reshit, Commandments/Mitzvot, Defining Jews & Judaism, Gentiles & Other Faiths, Parashah Insights.